In "Little Gidding," the last of North American poet T.S. Eliot's Four Quartets, he writes, "For last year's words belong to last year's language/And next year's words await another voice." While we reflect on the many blessings of 2018 at the Passaic Neighborhood Center for Women, we welcome the voices of 2019, secure in the knowledge that the God who has brought us here will continue to provide for us as we journey forward together. After 5-plus years of growth toward providing a peaceful, safe and welcoming place for the women of Passaic, we continue to rely on your generosity to carry us through. In reality, we cannot find enough words -- last year's or next year's -- to express adequate appreciation for the faithful support we have received from near and far. So, we will allow the theme of the entire five years of our existence to carry our New Year's message -- "Thank you and God bless you!" This is a very recent picture of our Wednesday English class taught by Marie Russoniello Mead. There are women in this class who have different countries -- and even different continents -- of origin. Seemingly, they gather each week to learn English. In the process of learning English, however, they build relationships -- and relationships are empowering. And, according to the mission statement of the Passaic Neighborhood Center for Women, " . . . when women are empowered, the family is strengthened." We believe that strengthening families is one of the greatest things we can do to serve God's people in Passaic. While this picture has the potential to paint thousands of words, we share it with you today to convey just two words -- THANK YOU! On this Thanksgiving Day, we THANK YOU for helping us to provide a peaceful, safe, welcoming place for our women to express their needs. We THANK YOU for assisting our women to form supportive relationships. 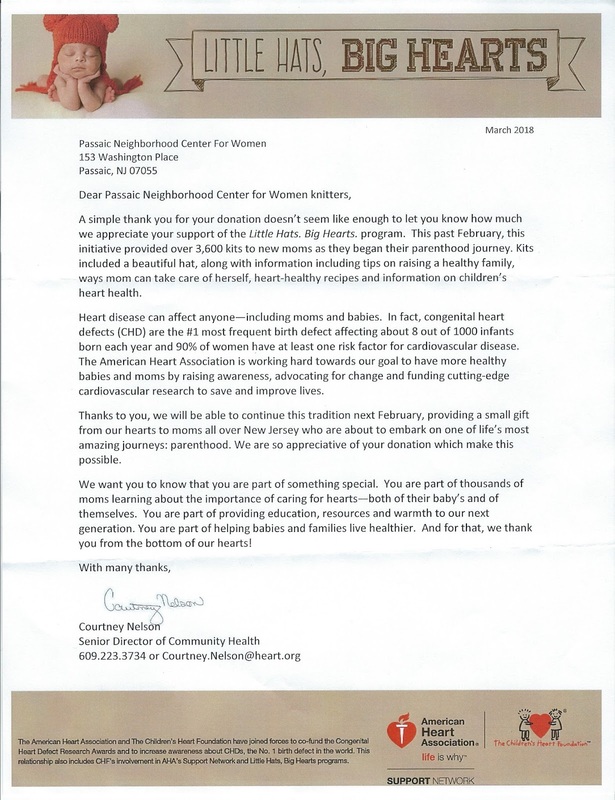 We THANK YOU for providing the means -- through your donations and other support -- for over 11,000 visits by the women of Passaic during the first five years of the Center's existence. Without our many supporters, this ministry would be impossible. If you have not yet viewed our fifth anniversary video, please click here to see how far the Center has come. We are so very grateful for the assistance of all our donors during the past five years. As we approach the holidays, we wanted to make you aware of some of the needs of the Passaic Neighborhood Center for Women. If you are able to assist with any of these needs, please contact Sister Ann Marie at sam@patersondiocese.org or (973) 470-0844. Diapers: Any size, but especially sizes 4 and 5. We are grateful for any assistance you can give. As we continue to celebrate our fifth anniversary, the Center's new video has been posted on the website. Please visit our homepage, ncwpassaic.org, and scroll down to view the video. 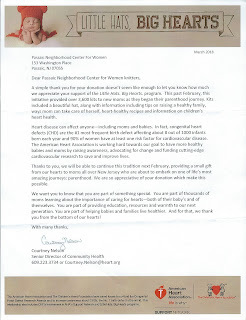 As always, we are grateful for your support of the Passaic Neighborhood Center for Women. All Kinds of Celebrations . . . While we celebrate the Center's fifth anniversary, we also want to commemorate the recent special days of our co-sponsoring religious communities. We remembered the Sisters of Charity on September 27, the Feast of St. Vincent DePaul and on September 29, Foundation Day of the Sisters of Charity of Saint Elizabeth, Convent Station, NJ. Thank you, Sisters of Charity, for your years of dedication to the Passaic Neighborhood Center for Women. Today on the Feast of St. Francis, we remember the Franciscan communities who have served us faithfully -- not only the Franciscan Sisters of Peace, the Missionary Sisters of the Immaculate Conception of the Mother of God (SMIC) and the Sisters of the Sorrowful Mother who currently staff the Center, but also those communities of Franciscan women and men who have supported us in so many ways through the years. As promised, here are some photos from our fifth anniversary luncheon yesterday. We are grateful to our women who provided the food and to our board and volunteers who attended the luncheon and provided gifts for our raffle. A good time was had by all! Our women enjoy their lunch. Everyone received a parting gift. The youngest in attendance -- one month old! to catch up with each other outside the classroom. It's not over until the last floor is swept! Thank you to everyone who has brought us to our fifth anniversary. In case you missed it, here is the article about our fifth anniversary that appeared in The Beacon, the newspaper of the Diocese of Paterson. Today our women will celebrate by preparing and sharing food that is native to their culture. We always have a good time when our women prepare a celebration! Since opening our doors on September 24, 2013, the Center has seen over 10,600 visits from the women of Passaic, who represent 13 different countries of origin. We have had 47 volunteers, including 26 Sisters from seven different religious communities, eight women from local parishes and neighborhoods, and 13 college students. We believe that the Center "works" because of the collaborative nature of this ministry. At the Center, our women find a peaceful, safe and welcoming place to express their needs, to become connected to community resources to fulfill their needs, and to strengthen themselves and their families through educational growth. 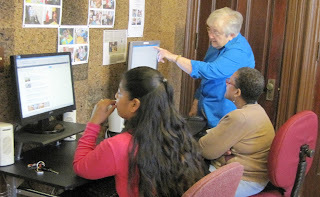 Here, our women have learned English, both through face-to-face classes and Rosetta Stone software. They have learned art, quilting, crocheting and knitting. They have fed their families with vegetables grown organically right here at the Center. They have prayed, attended workshops and received other assistance. We have received financial support from donations to the Partners in Faith Capital Campaign of the Diocese of Paterson, donations and grants from religious communities and parishes, grants from the County of Passaic, donations from individuals, schools, and parish and community groups, and so much help from the staff of the Paterson Diocesan Center! We have distributed over 25,000 diapers, 30,000 baby wipes, and thousands of dollars of grocery gift cards, all received from donations. As we begin the next five years, we say THANK YOU and GOD BLESS YOU! We could not have done it without you! And, of course, because we know that God will not be outdone in generosity, we ask you to continue to support our mission in any way that you can. Call us at (973) 470-0844 or email Sister Ann Marie at sam@patersondiocese.org to arrange for a donation. We also take online donations on our website, ncwpassaic.org. Stay tuned for pictures from today's celebration, a brand new video, and more!! 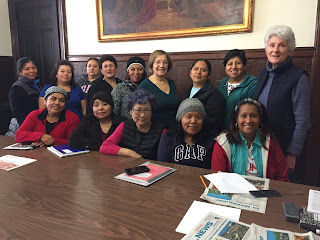 We are grateful to everyone at The Beacon, the newspaper of the Diocese of Paterson, NJ, for this week's article on the fifth anniversary of the Passaic Neighborhood Center for Women. Please take a moment to read the article (available here) and share it with others. This ministry thrives because of the collaboration of many people. We are so very grateful for the support! We are always so happy to share with you the progress that our women continue to make here at the Center. Sometimes, photos tell the story in the best way. In this photo from November 2013, Sister Catherine Drury, SC teaches one of our earliest computer classes. She is using the second-hand computers that we had at the Center at the time, which were donated by our generous benefactors. The computers served us well until we had to upgrade when we began to offer the Rosetta Stone program in 2015 and purchased our "second generation," refurbished computers. 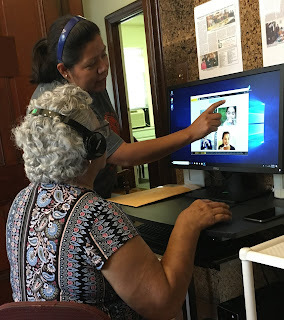 "Fast forward" to July 2018: The photo below also depicts teaching and learning on the computer, but in this case, it is one of our women who is experienced in using Rosetta Stone teaching another woman who is new to Rosetta Stone. Additionally, our brand new "third generation" computers are being used. Thanks to a grant from the "We Care, We Share" program from the Church of Christ the King in New Vernon, NJ and the donations we received from last year's "Giving Tuesday," our women use new computers and headsets for their supplemental English learning. What a difference five years makes! We are so very grateful to our generous benefactors for their support during these five years. We are also proud of our women who are becoming empowered to be leaders and teachers, not only here at the Center, but in the community and in their families! As you know, we are always grateful to everyone at The Beacon, the diocesan newspaper, for its coverage of events here at the Center. Sometimes, though, there are articles in The Beacon that we want to point out because of their coverage of our friends and supporters. This week's issue offers one of those opportunities. Please see page one (available here) for an article by Michael Wojcik about the dedication of new trees and a bench in Paterson's Eastside Park to honor the Missionary Sisters of the Immaculate Conception of the Mother of God (SMIC), who served in Paterson for 92 years. As the article mentions, Sisters from the SMIC community serve as volunteers at the Passaic Neighborhood Center for Women. In fact, the SMIC community has supported the Center in many ways -- even before we opened our doors in September 2013! We are grateful to the Sisters of the Immaculate Conception of the Mother of God for their continued support here in Passaic and for their over 90 years of service to God's people in Paterson. Rest in Peace, Dear Friend! Today we say goodbye to one of our beloved former volunteers, Sister Marcella McHale, FSP, who passed away yesterday. 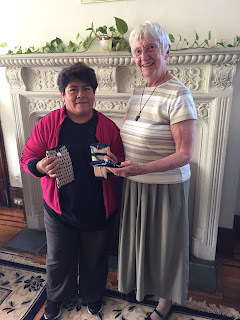 We send our sympathy to Sister Marcella's community, the Franciscan Sisters of Peace, and to her family. 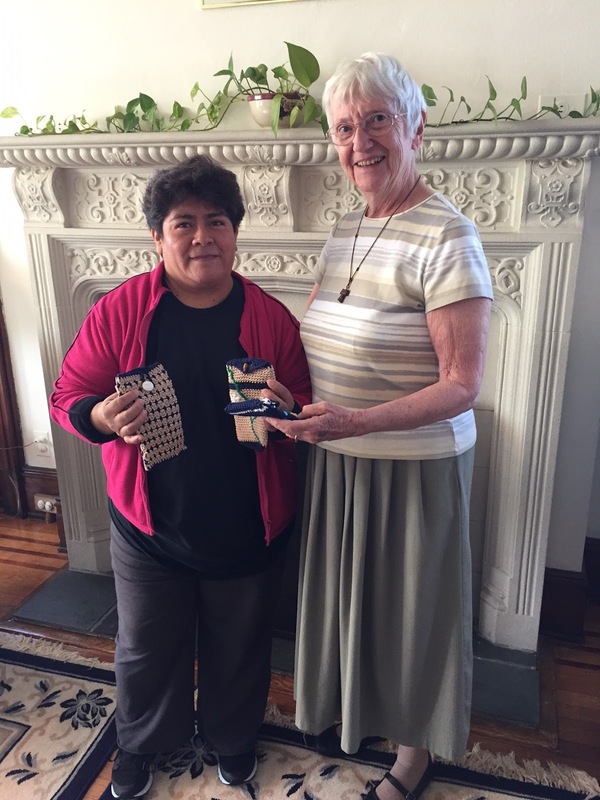 In 2014, Sister Marcella began to teach English here at the Center. Her students loved her gentle and humorous ways and they responded well to her. She was always willing to fill in whenever we needed a substitute, even if that meant traveling to Passaic two or three times a week. 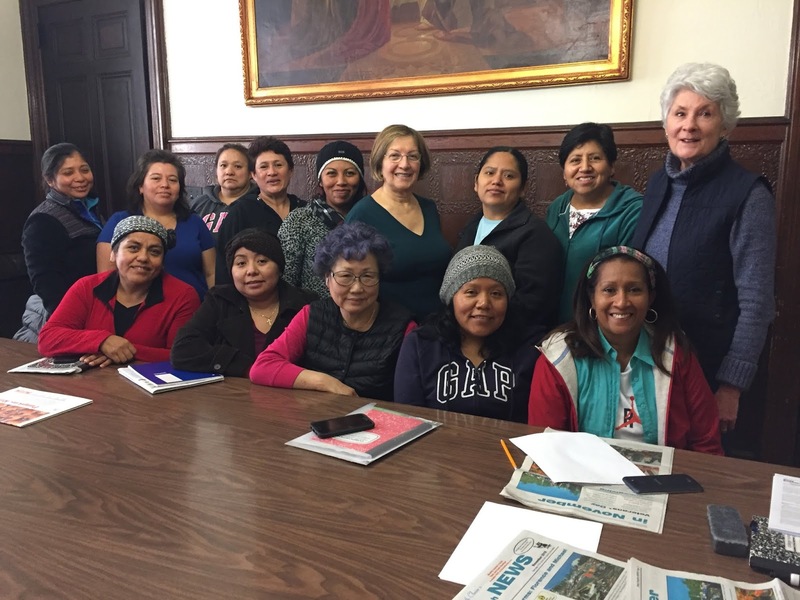 The Passaic Neighborhood Center for Women enters its fifth year of existence because of the dedication of so many people, especially its volunteers. Rest in peace, Sister Marcella. Thank you for the love and compassion you gave us! This week is National Volunteer Week. How grateful we are to the volunteers who keep the Passaic Neighborhood Center for Women running. Last year, our volunteers served over 700 hours! "Thank you" seems so small compared to the work they do for us, but it is all we have, so THANK YOU, VOLUNTEERS!! As our supporters know, the Passaic Neighborhood Center for Women is committed to addressing food insufficiency in the neighborhood. We continue to provide the materials for women to grow their own vegetables to feed their families and we continue to provide supermarket gift cards when necessary. Additionally, we provide diapers and baby wipes for some of our families, so that they might have more money to spend on food, especially at the end of the month. We are happy to share that, in addition to providing direct support for our hungry families, we are also participating in focus groups as part of a research study entitled, "Understanding FMNP Redemption Barriers," by Dr. Renata Blumberg and her students at Montclair State University. Dr. Blumberg, Assistant Professor of Nutrition and Food Services at MSU, has visited the Center many times, has assisted in our garden and has previously interviewed our gardeners. Her present research centers on the Farmers' Market Nutrition Program (FMNP) associated with the Special Supplemental Nutrition Program for Women, Infants and Children (commonly known as "WIC.") Redemption rates of FMNP vouchers are not as high as they should be. Why is that? Dr. Blumberg is dedicated to finding out. By participating in her research, the Passaic Neighborhood Center for Women hopes to begin to move beyond merely feeding the hungry toward addressing the reasons why they are hungry. We are grateful to Dr. Blumberg and her students for including us in their research. Dr. Renata Blumberg during a recent focus group session. Dr. Blumberg provided a nutritious, delicious lunch for the participants. As you know from our February blog post, our crocheters participated in the American Heart Association's "Little Hats, Big Hearts" program. We are proud of our women and happy to share with you the letter of thanks they received. We are proud of our crocheters who are participating in the American Heart Association's "Little Hats, Big Hearts" project to observe American Heart Month during February and to "empower moms to live heart healthy lives and to help their children do the same." Each woman has crocheted several red hats to be shared with babies born during February in local hospitals. This project is in conjunction with The Children's Heart Foundation. 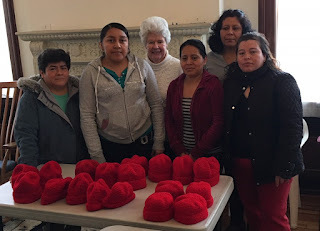 Here is a photo of some of our crocheters with our Associate Director, Sister Elaine (who coordinated the project), as they prepare to send their hats to "Little Hats, Big Hearts." We are so grateful to our women -- who have such big hearts -- for sharing their talents with the community!